Interested candidates are invited to apply for work as milkers and farm workers with FRS Farm Relief Services and those who require upskilling will have the unique opportunity to complete a 20 day programme involving 4 days class room based training and 16 days practical work experience on host farms organised by FRS. On successful completion of the programme, candidates will be offered work through FRS. The work could potentially earn an individual up to €8,000 or more and participants will be paid during their training. The peak months for seasonal work is January/February to May/June annually, but there are full time opportunities also available. Women in Agriculture; with interested in work involving milking, calf rearing and/or livestock husbandry. 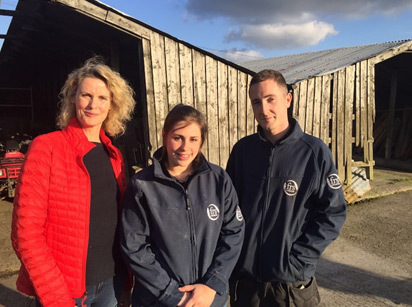 FRS milking operators, Jennifer Matthews and Josh Phelan, both successfully completed the programme and were featured along with farmer James O’Brien from Kilkenny on Ear to the Ground.